You may recall that I spent an afternoon last week with a class of second graders, and together we shaped the outline for a mystery story, which I proceeded to write. The outline came from the elements the children chose for the story, and we did it this way: I gave them the particular element (for example, “We need a name for our hero and heroine.”) I took a number of suggestions from the class and then we chose the winner in a random way. Our main characters are twins named Gavin and Christiana. They’re eight years old. They live in Fridley, Minnesota. They have a pet rattlesnake. The mystery: Bob has gone missing (and is at the bottom of a well). The sad ending chosen for the story is that Bob does not survive. Although he’s brought up from the well, at the story’s end, he rattles his last rattle. At the end of the story, all these suggestions come into play, with one very surprising result. I hope you enjoy this collaborative effort. Me, I’ve never had so much fun. The children will be creating some of their own artwork to accompany the story. When they’re finished, and with their permission, I’ll share that with you. Christiana and Gavin were twins. They lived in Fridley, Minnesota, in a big house with a big yard and big shady trees. Before the city grew around it, the house had been part of a huge farm. Even now, there was still a garden and lots of room where wild things grew. There was even an old stone well that had once supplied water for the farmhouse. On their eighth birthday, the twins received an unusual present from their mother. It was—I’m not kidding you—a rattlesnake! Now, most people would think that a rattlesnake is the most terrible, horrible gift anyone could get on their birthday. But not Christiana and Gavin. And here’s why: Their mother was a herpetologist, which is a big word that means a scientist who studies snakes and other scaly creatures. The twins were used to things that slithered and hissed and felt cold to the touch. Their mother explained that this rattlesnake was a very special one. It was the last of its kind, a snake that had been part of a very top secret government experiment many years before. The government wanted to increase the intelligence of some rattlesnakes so that they could be used as spies in desert countries. The experiment worked—sort of. The snakes became very smart and could communicate with humans using their rattles as a code. One rattle meant yes. Two rattles meant no. Three rattles meant, well, it could mean many things. For the twins, it would come to mean something really important, which I will tell you about later. There was one big problem with that government experiment years ago. 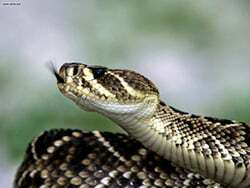 When the rattlesnakes became smart, they also lost their poison. They could no longer defend themselves against the other creatures of the desert. Those that were released into the wild were never heard from again. And now there was only one very old, very smart rattlesnake left. The twins named him Bob. Bob lived in a large aquarium that the twins kept in their bedroom. The first thing they did every day when they came home from school was run to their room and say hello to Bob. They would find him coiled up, his little forked tongue flicking the air, his black eyes eager to see them. They would ask him about his day. Hide-and-go-seek was their favorite game. Bob was very good at it. He could hide in places the twins would never look, and he was so smart he could always find them in the places where they hid. They only played the game inside the house, because outside there were hawks and foxes and dogs who would love to eat a rattlesnake that couldn’t defend itself. One very sunny spring day, the twins came home from school and ran to their bedroom. But to their surprise, Bob was not in his aquarium. They looked everywhere for him. They looked in all the places he hid when they played hide-and-seek. They even looked in all the places he was too smart to hide, like the stove and the microwave and the dishwasher. They couldn’t find him anywhere. But he heard no rattle in reply. Then Christiana noticed that the back door was open, just the littlest bit but wide enough for an old rattlesnake to slither through. The twins ran outside into the bright sunlight. Because it was spring, everything was growing big and green and wild, and there so many places for a snake to hide, if that’s what a snake wanted to do. No rattle-rattle-rattle to let them know Bob had heard. They peered under the steps. They crawled through the garden. They dug among the shrubs. They even looked up into the branches of the oaks and the elms, although rattlesnakes are not very good at climbing trees. But they could not find Bob anywhere. Then a shadow appeared on the ground, circling and circling. The twins stared up into the sky. Above them flew a hawk, a deadly enemy of snakes everywhere. Now, instead of looking for Bob, they looked for clues that might lead them to Bob. And do you know what they found? First, they found a snakeskin. All snakes shed their skin so that they can grow larger. Even an old rattlesnake like Bob could still grow. And that’s what he’d done when he’d slithered out of the house, grown just a bit and left his old skin in the grass of the backyard. Next, they found a long, slithery line in the dirt of the garden. That was another thing snakes sometimes left behind, a trail made by their wiggly bodies as they wove across the ground. “He went that way,” Christiana said, pointing toward the far side of the garden. Above them, the hawk flew lower and lower, looking for an old snake to have for its dinner. In the tall grass and wild flowers on other side of the garden, the twins lost Bob’s trail. They startled a rabbit that went hop, hop, hopping away. They spotted a squirrel that chattered at them furiously from a nearby oak tree. They scared up dragon flies and butterflies and bumble bees, but no Bob. The twins walked to the old well, which stood in the middle of the tall grass and the wildflowers. There was a wooden crank built above the well’s stone wall. A rope hung from the crank and disappeared into the well, and the twins knew that at the other end of the rope was a bucket for hauling up the cool water. The well was so deep and so dark that the twins could not see the bottom or the wooden bucket there. Gavin began turn the crank. The rope began winding around the crankshaft. The bucket began to rise. Then Christiana heard a familiar sound. “Bob!” she cried, looking all around her. But she couldn’t see Bob anywhere. The sound came again, but faint and growing fainter. Finally the twins realized that the sound was coming from inside the well. Gavin cranked faster, and the bucket rose into sight. And there, in the bottom of that old wooden bucket Bob lay curled. His forked tongue flickered weakly. His black eyes seemed a little glazed, even for a snake. His rattles hung limp at the end of his tail, barely making a sound now. They lifted him and held them in their hands together, and they could feel that Bob was almost at the end of his journey as a snake. He gazed up at them. His tongue eased from his mouth, and, as if waving goodbye, gave a final flicker. With his tail, he gave one last rattle-rattle-rattle. And then Bob was gone. With tears in their eyes, they carried him to the house. Their mother was waiting for them on the back steps. They laid Bob down gently. “There will never be another snake like Bob,” the twins said. “No more snakes,” their mother said. “How about a scorpion?” Gavin said. “Or a giant ant,” Christiana said. 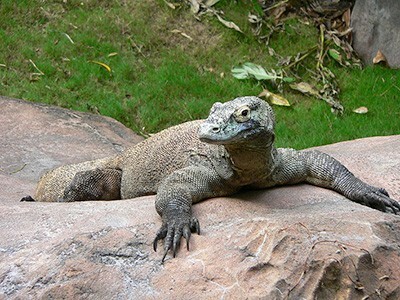 And that’s how the twins ended up with Kyle, the Komodo dragon.